A reader of mine sent the above photo to me. He does a lot of store searching and said that Walmart is the only place that he’s seen a gray Overlord in. Guess thats a Walmart exclusive then. Thanks to SkyNerf for the heads up. Original photo of mine below for comparison. The new Buzz Bee Overlord. Retailing for $29.99. I’ve been too busy these past weeks to check the stock at local department stores, but I had time today to check out Target. I can now say Southern California is stocked. Hit the jump for photos of new Buzz Bee products and more photos! Target.com has put up these 4 new Buzz Bee blasters on their site. Store locators don’t have them in stores yet, and the visual box art seems to still be under construction, but still new info is better then none! The Orion, aka Range Master, is set to retail for $17.99. This looks to be the most exciting as it features the most range, and it comes with a scope & barrel attachment as well. For whatever reason, The Buzz Bee Hunter is on the box art. 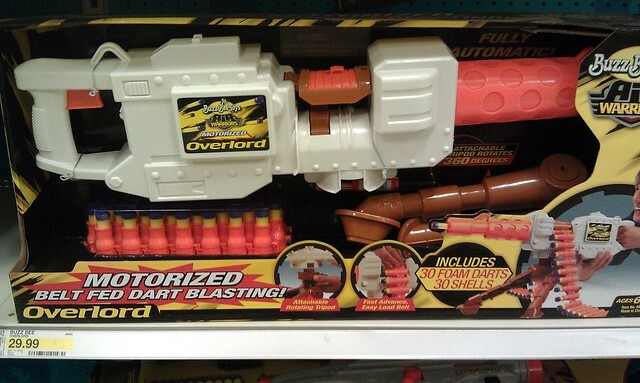 The Overlord will retail for $29.99. 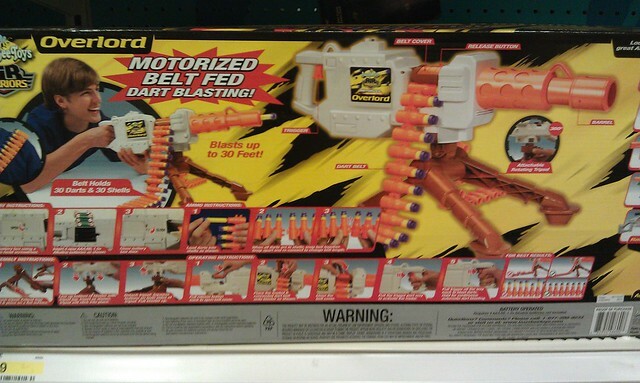 This seems to be a motorized Belt Blaster. I wonder if Belt Blaster belts will work with this? 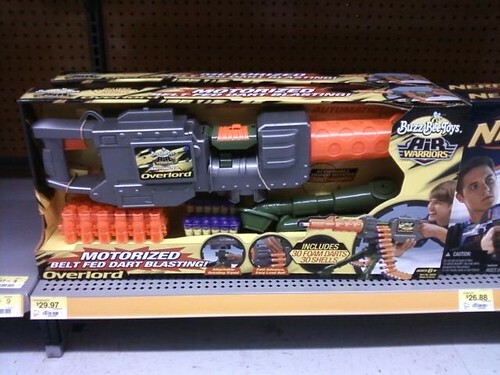 Note the Belt Blaster pictured on the box art, and the Tripod that this blaster will come with. The Cougar will retail for $10, and it looks like it has a stock attached. With a new diagonal clip perhaps? I can’t tell how to prime this blaster though. Note the Clip Tek on the box. The Jaguar is set to retail for $5, and the clip reminds me of the Mag Strike. Thanks to Nerf Mods & Reviews for the image hosting. Also someone in the comments is claiming, without proof, ranges of each blaster, saying hes fired each of them.